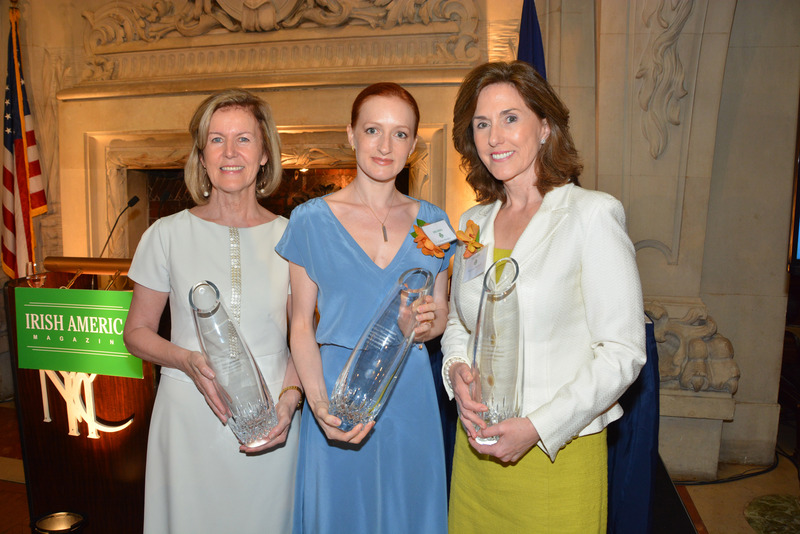 On June 30th, Irish America magazine celebrated the Top 50 Power Women with an awards luncheon in Manhattan. The event highlighted some of the most influential and innovative Irish and Irish American women working across multiple fields, from media, literature, and the arts to politics, finance, and medicine. Guest speakers Anne Anderson, Gillian Murphy, and Maureen Mitchell with their House of Waterford Crystal Essence Vase awards. Recognition of the contributions of the ancestors was a dominant theme throughout the luncheon, as well as the acknowledgement that the contributions many of the most important female figures, personal and public, went under-recognized during their lifetimes. It was an event, too, that took the opportunity to interrogate how, and how often, women were sidelined in Irish history in the past 100 years, particularly during the 1916 Rising. The event’s three guest speakers – Ambassador Anne Anderson, the first female Irish ambassador to the U.S.; Maureen Mitchell, president of Global Sales and Marketing for GE Asset Management; and Gillian Murphy, principal dancer for American Ballet Theatre – touched on the various aspects of contemporary professional femininity, from the barrier-breaking diplomatic appointments of Anne Anderson to the more subtle changes to corporate acceptance women have to endure in traditionally male-dominated fields. 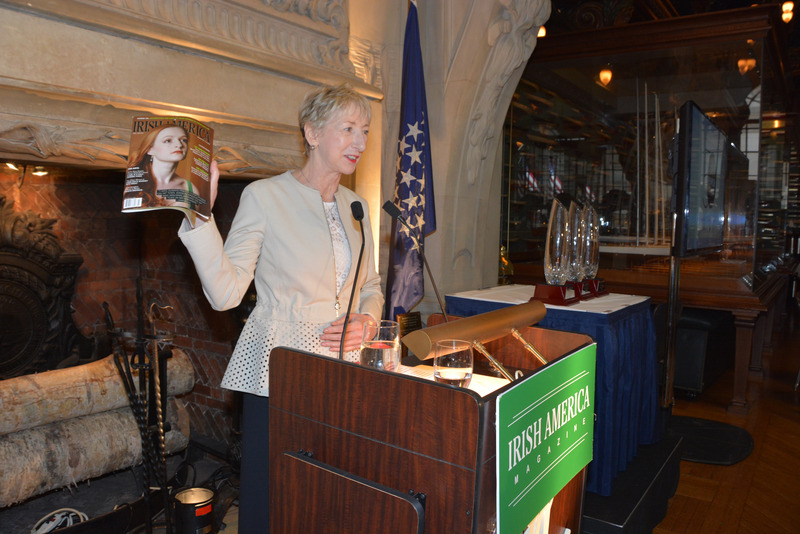 Irish America co-founder and editor-in-chief Patricia Harty introduces the inaugural Top 50 Power Women June 30 in Manhattan. Anne Anderson, who was born in County Tipperary, spoke personally of her over 40 years of experience in the diplomatic service, highlighting that in most of her positions she was the first woman to hold the post. “Sometimes it’s really hard to remind myself of just how challenging it was in those initial years. It was a department I would hardly recognize,” she said, referencing how male the department was and the fact that she was the first woman to be posted abroad in 1976, at the age of 24. “I was already married at the time…. And believe me, I had to argue in order to get a married officer’s allowance and married officer’s accommodation, because nobody had any concept of how you dealt with married women in the diplomatic service,” she said. She also touched on the fact that the work of gender equality is not finished, and to accept an award on behalf of women is to accept the challenge of leadership to continue to work towards a fairer society. “Today’s awards recognize 50 of us as ‘power women.’ Now for some of us it might not exactly be our self-description, or we might ask ourselves where exactly we fit along the power spectrum, but I think there is one point on which every one of us would agree. Being ‘powerful,’ is of limited interest as a label, or even as an accolade. There has to be a point or a purpose to it. We want to have power for something – to be in a position to shape and influence things, to help bring about change,” she continued. GE’s Maureen Mitchell, whose father was a lobster fisherman in County Sligo and whose mother emigrated from County Galway, touched on the more personal aspect of women’s inheritance from their maternal ancestors, and acknowledged the “steady hands” of her parents influence on her ability to adapt to a professional atmosphere that would have been completely unknown to her working-class upbringing. “Irish women are natural leaders. We have seen that. It’s in our DNA, our history, our mythology, our literature, our politics,” she said. All three guest speakers received the House of Waterford Crystal Essence Vase. The Irish America Top 50 Power Women Awards Luncheon is sponsored by House of Waterford Crystal; Mutual of America; Guinness; Coca-Cola; GE Asset Management; Prudential; Alison Metcalfe and Tourism Ireland; Kyle Clifford, American Ireland Fund; Brian Stack, President Emeritus, and Elizabeth Crahill, the new CEO of CIE Tours; Deputy Consul General Anna McGillicuddy, Irish Dept. of Foreign Affairs; and UCD Michael Smurfit Graduate Business School. Honorees in attendance included head of social media for CNN Samantha Barry, New York Post columnist Maureen Callahan, New York Times columnist Maureen Dowd, Irish Great Hunger historian Christine Kinealy, Siegle+Gale CMO Margaret Molloy, artistic director of the Irish Repertory Theatre Charlotte Moore, NY1 reporter Kristen Shaughnessy, and authors Jennifer Egan, Mary Pat Kelly, and Alice McDermott. We, Irish are proud of you Ladies !! Heartfelt thanks to the Irish America team for recognizing me as one of the Top 50, am sorry that I missed the event and the opportunity to meet my co-honorees.